← a grizzly story: bear pit long gone! 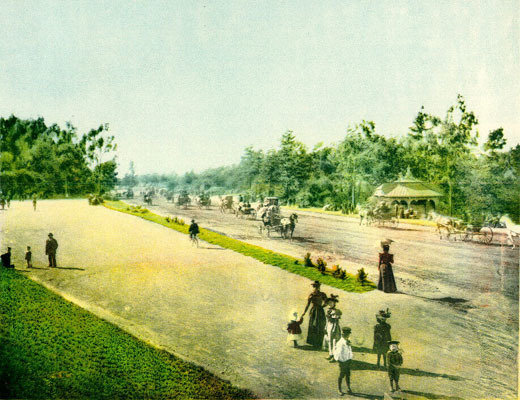 environmental history of golden gate park? What is “environmental history?” The working definition is: “a branch of scholarship that focuses on studying the interaction between human culture and the environment over time.” By that measure, an environmental history of Golden Gate Park would logically start in 1870 at the inception of the park (which is definitely a product of human culture!) and explore environmental changes associated with the park over the past 140 years. 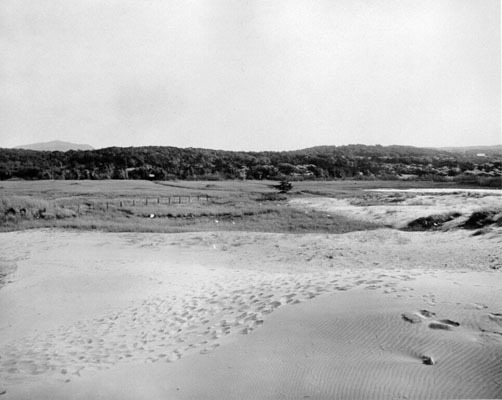 Since, by 1870 the San Francisco peninsula had already witnessed considerable environmental change due to human presence, a truly thorough environmental history of the park (as a site) might begin with an analysis of what the area was like before the arrival of humans, or at least before the arrival of settlers of European descent. But the fact is, the history of the park proper has really only unfolded since 1870. And the park and the city of San Francisco have grown together. Which is why most historians have focused on the cultural aspects of the park’s history, i.e. on the people who have shaped it, on the park as a work of art, a cultural phenomenon, in the context of city politics, etc. Yet framing the history of the park in terms of environmental history raises so many interesting questions that have not been addressed! Starting with the most basic: how have soil, water and air quality changed in and around the park? How have the topography and the hydrological patterns changed and what are the environmental consequences of those changes? How has the the composition of wildlife changed (both in the park itself and in the surrounding environment)? When did certain populations start to decline in and around the park (quail?) and what environmental changes precipitated those declines? Have new species appeared and thrived? When did the first english and cape ivy appear in the park and what were the major factors that contributed to their flourishing? When did the first signs of aging appear in the park’s urban forest (did those cypresses, pines and eucalyptus thrive normally, planted on sand dunes with only a thin layer of topsoil)? It would be fascinating to chart the environmental history of Golden Gate Park over its first 150 years. Wouldn’t it be eye-opening to see a GIS map of the park over that time, with layers for topography, soils, water, vegetation, wildlife and cultural changes in and around the park . . . a visual inventory of environmental change over the past 150 years?! What important insights might be gained from such a history, lessons that could help us in planning for the park’s future in an era when we are increasingly concerned about environmental impacts! But what a challenging project; so much of this history has been lost! What this exercise really shows is that we could be developing a baseline environmental inventory of the park right now, at this point in its environmental history, so we at least have the environmental picture of it today. Then we could base future planning on sound environmental data. I'm a landscape historian and professor emeritus of landscape architecture, UC Davis. I live in San Francisco. 5 Responses to environmental history of golden gate park? You ask about quail in GG Park… A. Starker Leopold (yes, Aldo Leopold’s son) wrote a book about California quail (with that title) that remains the definitive source of information on that subject over 25 years later. It is a fascinating book and I recommend it to you. In that book, Mr. Leopold describes the historic range of quail in California with maps that suggest that there may not have been quail in San Francisco prior to the arrival of Europeans. This is not surprising given that San Francisco was about 2/3rd sand dunes—mostly barren– prior to the arrival of Europeans. Quail require leguminous shrubs for food and cover and they need a year-around water source within their relatively narrow range, also not easily found in pre-settlement San Francisco. The history of quail in San Francisco is a good example of how natural histories of San Francisco tend to become political tools. In this case, those who advocate on behalf of planting quail habitat are usually unaware of the fact that they are not being consistent with the desires of native plant advocates who are trying to replicate pre-settlement San Francisco. You won’t hear them openly debating that point because it is more convenient to ignore this historical fact than to pit the interests of bird lovers against the interests of plant lovers. It’s a conundrum and there are many more examples (including the herons nesting in the tall non-native trees at Stow Lake and Lake Merced that were planted by Europeans) of how choosing to replicate a particular period of natural history is largely an ideological, not a scientific choice. So, when listening to someone telling your their version of the natural history of GG Park, try to keep in mind their particular agenda. That will help you keep it in perspective. Thanks for this reference! I will definitely get the book and write some more about the quail population in the park. I would contribute: cycling in the Park, past and present. In the original construction of San Francisco’s Golden Gate park, where did the topsoil come from. Also how much topsoil did the landscape experts use to achieve such magnificent growth of grasses, flowers and trees. On the eastern 270 acres there was fairly good sandy loam, with a 6-10″ layer of leaf mold on top of that in areas where shrubby oaks were established. This eastern 1/3 is where work commenced on the park. It would have been prohibitively expensive to spread topsoil on the remaining 700+ acres, so they used a method that relied on the natural process of plant succession to build up the soil, seeding dunes with a mixture of barley and native lupines, which germinated right in the sand. Larger species of shrubs and trees were grown in a nursery for a couple of years and then transplanted onto the stabilized dunes.